Ignite cda’s original redevelopment district, the Lake District, was formed by the city council in 1997. It originally encompassed 729 core acres, including portions of Midtown, Downtown and Northwest Boulevard. In 2016, 58 acres were de-annexed resulting in $337,000 in annual renevue to the benefit of taxpayers, the City of Coeur d’Alene, and other taxing districts. Current size of the Lake District is 671 acres. The Lake District will expire in 2021. Legend – The area shown in blue is the Lake District. The areas shaded with white at the top northern border depict parcels recently de-annexed. Note: Although we have made every effort to give the public an accurate view of the Lake District area this map is only an approximate and not a legal binding district map. If you have any questions please feel free to contact us. It’s the ultimate live, work, play atmosphere. The thriving Riverstone development has it all in a beautiful riverside setting. It’s also a pretty awesome destination for those who love to shop, dine, or take in the latest movie. With partnership funding from ignite cda, Riverstone developers transformed the former site of an abandoned lumber mill and gravel pit into a bustling 155-acre “urban village” along the Spokane River. And this city within a city continues to grow. Riverstone hosts a wide array of businesses (which employ hundreds of employees) and over 130 well designed condominium units. Ignite cda committed funding for public improvements such as roads, streetscaping, sewer and water lines, as well as traffic signals, to get the development off the ground. The urban renewal agency also worked with developers on the construction of the $3 million 11-acre park and pond, which was gifted to the city of Coeur d’Alene upon completion. “We love the whole Riverstone urban village concept. We're excited about the additional people coming down here and all the new businesses coming in—we’re thrilled to be a part of it! Walkers, runners and cyclists can also enjoy 2.5 miles of public trails through the scenic development. Visit the Riverstone website at riverstonecda.net. Wow. What a park. What a location. What an uplifting eye-pleaser. Most of all, what a tremendous attraction for downtown Coeur d’Alene. There’s lots to love about McEuen Park: Its proximity to Lake Coeur d’Alene, downtown, and Tubbs Hill, for starters. Despite all these alluring attributes, however, this scenic 20-acre expanse entertained relatively few people over the years. A new era for McEuen Park has emerged, thanks to financial support from ignite cda. 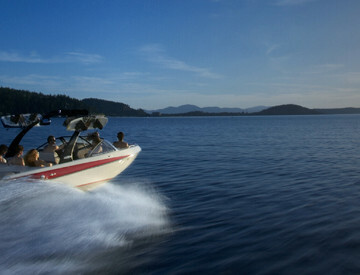 Participating in the redevelopment of this lakeside park has been among ignite cda’s priorities since the urban renewal agency’s Lake District was formed by the Coeur d’Alene City Council in 1997. The $20 million transformation of the downtown park is expected to attract additional visitors to downtown Coeur d'Alene, bring in more events to stimulate the economy, and pump some serious energy into the city's downtown sector. Work features new public art, a re-designed Veteran’s Memorial, an amazing interactive playground for kids of all ages, a new dog park, more user-friendly and efficient public parking, a new Front Avenue promenade with community gathering areas, a natural amphitheater, a new pavilion, a new grand plaza and waterfront promenade, a new harbor house, scenic paved trails and an interactive splash pad with more than a dozen colorful water features. What a difference a decade makes. Ten years ago, getting into and out of the North Idaho College campus could prove to be a major headache with only one option for motorists. Today, with two beautifully designed access points, traffic flow and safety have significantly improved as part of the Higher Education Campus development project. There is also plenty of space for multi-institution growth—an enormous economic benefit for the community. The Higher Education Campus is a unique partnership between the city of Coeur d’Alene, ignite cda, North Idaho College, University of Idaho, and Lewis-Clark State College. These entities shared a vision to create a collaborative higher education environment to provide higher academic opportunities and a positive economic impact for residents of northern Idaho. This impressive educational infrastructure not only offers higher academic opportunities, but attracts living-wage jobs to support the area’s growing population and makes our community an even more appealing draw, both for students and those looking to relocate—residents and businesses alike. The multi-campus setting offers 2 and 4 year programs, as well as courses offering Master Degrees and Ph.Ds, and technical schools as well, providing a strong asset to our local workforce. Ignite cda assisted in the installation of necessary infrastructure upgrades such as sewer, water and fiber optic lines, a vastly improved road network with signalized intersections, and funding for attractive public art. The Higher Education Campus will impact the entire region for generations to come, and ignite cda is a proud partner. It’s the envy of communities across the country. The impressive 123,000-square-foot Salvation Army Kroc Community Center opened its doors in May 2009 and the facility has been nothing short of a tremendous success story. The community center was made possible by a grant from McDonald's restaurant founders Ray and Joan Kroc, who provided a $72 million grant for construction of the popular facilities. Participation from ignite cda supported necessary infrastructure and site improvements to land this Kroc Center in Coeur d’Alene. It all began to take shape in 2006. Back then, the Kroc site was an enormous pit; a refuse site for asphalt, concrete and other construction waste adjacent to the old county garbage dump off Ramsey Road. Before opening its doors in May 2009, membership of around 3,000 was anticipated. Today, the expansive center has 16,500 members and employees more than 200 people. And it continues to grow. In 2013, the Kroc Center constructed a $1.15 million expansion that added another 2,700 square feet on the west end of the community center. The Kroc also includes a theater with seating of up to 400 people, a chapel, community meeting rooms, expansive weight room, full-size gymnasium and indoor track. The citizens of Coeur d’Alene love their downtown library. And so do our visitors. Use of the popular library has risen dramatically since it opened in 2007 with support from ignite cda. On any given day, 800 to 1,000 people visit the busy library overlooking McEuen Park and Lake Coeur d’Alene. A centralized location and more amenities have combined to make the downtown library far more popular than the former library on Harrison Avenue, which was bursting at the seams. For example, library attendance at the new library in 2011 was 107,000 higher than the final year of the old library. Ignite cda partnered with the city of Coeur d'Alene and the Coeur d'Alene Public Library Foundation to help make the dream of a public library downtown a reality. Without urban renewal funding, which targeted land acquisition, the endeavor would not have been possible. The expansive 38,500 square-foot downtown facility attracts people who want to use computers, take advantage of free Wi-Fi, attend community meetings, and take part in children and adult programs. Programming and meeting space was virtually nonexistent at the Harrison Avenue library. The new library has a Community Room with seating for 200 and is designed for multiple uses. At the old library, children's programs were conducted in the middle of the children's bookshelves. The new building has a story room that is also equipped for children’s movies and even a portable puppet theater. Location, location, location. When you’re promoting the beautiful community around you, there’s no better way to start than by building a Chamber of Commerce that is smack-dab in the middle of what is arguably one of the most scenic spots in the region. Located just off the shores of beautiful Lake Coeur d’Alene with tree-lined mountains as a scenic backdrop, the Coeur d’Alene Chamber building offers magnificent views and an unbeatable high-traffic spot—at the gateway to the Lake City’s bustling downtown. Built in 2005 with partnership support from ignite cda, the inviting two-story office building offers plenty of windows, attractive rock and wooden beam accents and public art. Urban renewal funding aided in the establishment of project-related public improvements, including demolition of the previous structure, site remediation, public rest rooms, streetscaping and a public gathering space. Corporate and local stakeholders saw tons of potential to enhance the vibrancy of midtown through revitalization efforts. In 2008, ignite cda partnered with the city of Coeur d’Alene and Fourth Street property owners to help reconstruct the arterial along a 10-block stretch on Fourth Street from Lakeside Avenue to Harrison Avenue. Work included street reconstruction involving sewer and water infrastructure upgrades, two elevated intersections designed to calm traffic, street and sidewalk beautification and enhancements, parking upgrades, installation of public art, eye-catching bike racks and new street trees. This public outreach effort was well received and transformed a deteriorated section of 4th street into a safer, more pedestrian friendly, vibrant corridor. Ignite cda will continue to partner with the city, midtown property owners, housing partners, businesses and residents on opportunities to further enhance the vitality of the midtown area. Ignite cda is thrilled to be an active partner in the flourishing North Idaho Centennial Trail system. In northwestern Coeur d’Alene, the beautiful Prairie Trail was made possible through a cooperative effort between ignite cda and the North Idaho Centennial Trail Foundation (NICTF). The urban renewal agency loaned the NICTF $2.5 million to acquire the abandoned Union Pacific railroad right-of-way to secure the project. The 5.25 mile section of trail winds through two city parks and is lined with trees and impressive views of the mountains and Spokane River. Stretching from the Riverstone development to the western edge of Coeur d’Alene on the Rathdrum Prairie, the popular Prairie Trail connects northern Coeur d’Alene with the Spokane River corridor and downtown. Ignite cda also played a pivotal role in construction of new segments of the trail system in the Higher Education Campus along the Spokane River and within McEuen Park downtown. Offering beautiful sweeping views of McEuen Park, downtown, Lake Coeur d’Alene and the mountains beyond, the 18-story Parkside Tower offers a prosperous mix of Class A office space, retail businesses and residential living—all of which lend itself to a healthy economic climate downtown. Retail businesses on the lower level of Parkside Tower—from fine eateries, to a popular bakery/coffee shop, and other visitor-friendly shops and meeting spaces—continue to thrive and attract scores of people to the downtown area year around. “The success of any central business district lies not only in its diversity of commercial and cultural activity, but its permanent residential component as well. In 2007, ignite cda entered into a partnership agreement with Miller Stauffer Architects to aid with the establishment of project-related public improvements including site remediation, a public-oriented water feature, and public right of way improvements (including asphalt overlays, sidewalks and utility enhancements). Ignite cda strongly believes public art adds great economic value and contributes to a vibrant community. Over the years, dozens of pieces of art in our city's core have turned heads, initiated conversation, and made for the perfect photo opportunity. Ignite cda is proud to contribute 2 percent of its annual tax increment revenue to the Coeur d’Alene Arts Commission for its use in acquiring and placing public art within our redevelopment districts. While most of the artwork ignite cda has helped finance is located within the Lake District (primarily downtown), the agency is also moving forward on financing artwork in the River District in the Riverstone area. From nature to technology to industry and science, the artwork depicts such a wide scale of interests and imagination; it’s as engaging as it is thought-provoking. Coeur d’Alene is growing up—literally. The Lake City’s skyline has risen in the past couple decades to include lofty high rises that help to boost activity and commerce in the city’s hub. A healthy downtown involves more than great shops and restaurants. When people live in the city center, they spend more time there dining, shopping and playing. Improving and expanding livable space in a downtown sector increases public activity and supports the economy. Ignite cda supported this concept when it entered into an owner participation agreement with the distinguished local architectural firm of Miller Stauffer Architects. Ignite cda partnership funding allowed construction of McEuen Terrace, a 15-story mixed use condominium/office structure fronting the library and McEuen Park. Ignite cda participated in project-related public improvements including street enhancements, a prominent water feature, utility improvements and streetscaping enhancements. Continuing its efforts to revitalize the eastern area of our Lake District, ignite cda provided partnership funding to construct an appealing 24-unit town home project on the corner of Mullan Avenue and 11th Street, providing a higher-density home-ownership option near downtown. This concept is in tune with the urban renewal mission to stimulate a more vibrant economic atmosphere in and near the city’s central business district. In 2006, ignite cda agreed to aid with the establishment of project-related public improvements including site remediation, architectural upgrades, streetscaping, and right-of-way improvements. Representing a classic “urban infill” project, Sherman Lofts provides a higher-density residential use in the downtown core area. Urban infill focuses on the reuse and repositioning of obsolete or underutilized buildings and sites for development that is essential to revitalizing blighted neighborhoods to create economic energy in the surrounding area. With the Sherman Lofts project, ignite cda agreed to aid with the establishment of project-related public improvements including site remediation, building demolition, alley improvements, streetscaping and architectural upgrades. In 2018, Kootenai County, in partnership with the City of Coeur d’Alene, constructed new surface parking lots adjacent to Memorial Park and Ball Field to help address parking needs associated with the Kootenai County campus and the need for parking during community events such as The 4th of July Fireworks and Parade, Downtown Street Fair and Ironman 70.3. An additional 227 space were created along with 11 dedicated ADA accessible parking spaces. The McEuen Park project, supported primarily by ignite cda funding, includes a parking solution that increased parking spaces in the immediate area from 595 to 719, including the renovated parking lot near City Hall which also accomodates RV's and boat trailers. A city parking lot map is available at maps.cdaid.org/parking. A 2016 study identified parking as one of the top three attributes a city needs to maintain a healthy business sector. It’s simple: If there’s not enough convenient parking, people will tend to steer clear. Years ago, ignite cda realized the strategic need to secure property for a future downtown parking garage. The old “Federal Building” block (bordered by 3rd and 4th Streets, and Lakeside and Coeur d'Alene Avenues) was selected as the preferred location. Ignite cda acquired strategic properties located on that block. 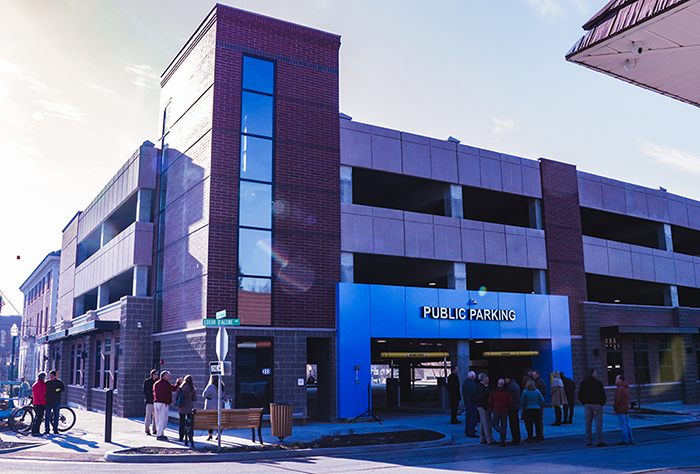 These efforts resulted in a $7 million partnership project between ignite cda and the City of Coeur d'Alene, who will own and manage the new facility, to design and construct a 350 space downtown parking garage. The garage will open to the public in December 2018.